In the course of Russians Northern War against Sweden (1701-1721), on the 11th of October 1702, the Russian troops seized the fortress of Nöteburg near the source of Neva and on the 1st of May 1703 the Fortress of Nyenskans was taken. The main task of the Northern War was accomplished: outlet to the Baltic Sea was now free for Russia. It was then necessary to make it safe from the enemies and so on the 16th of May (27th of May old style) 1703, a fortress was founded on Hare Island in a festive atmosphere. Alexander Menshikov, a close associate of Peter the Great, supervised the ceremony. The fortress was named St Pietersburgh, “the city of Saint Peter”. Since then this day is considered to be the date of the foundation of Saint-Petersburg. The construction of the city began in the area of the nowadays Petrodrad Side (formerly know as City Island), under the protection of the fortress. Its centre of originally in the area of the Trinity Square, near to the surviving wooden House of Peter the Great. In the area of the square there began to grow the first dwelling houses, trade and administrative structures. In the same year the wooden Cathedral of the Holy Trinity was erected that gave its name to the earliest square of Saint-Petersburg – Trinity Square. In autumn 1703 according to a drawing by Peter the Great the construction of the Admiralty shipyard fortified walls began in the estuary of the Neva. Around the shipyard there grew the Naval settlement that latter developed into a large populated district, the so-called Admiralty district of the city. Further upstream, in the Summer Gardens, was put up the Summer Place of Peter the Great and mansions of dignitaries. The victory in the Battle of Poltava in 1709 and the capture of the Viborg city in 1710 strengthened the position of Saint-Petersburg. The new city on the Neva played an important role in the establishment of Russia as a powerful naval state, in the growth of its foreign trade and policy. 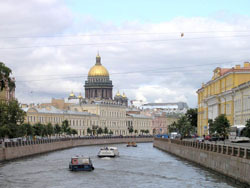 In 1712 St Petersburg was declared the capital of Russia. The development of the new capital opened up a page in the history of urban construction in Russia. Peter the Great himself supervised the construction of the city, which is testified by his own drawings and decrees related to the construction. It was the first ever attempt in Russia to create a large city according to a well-conceived plan. The work process was supervised by the “Municipal Chancellery” that compiled projects of “model” houses for various categories of inhabitants depending on their estate and property. In 1710 Peter the Great chose a place for the main religious centre of the new capital – the St Alexander Nevsky Monastery. The fact the monastery was given the name of the Price Alexander Nevsky, under whose leadership the Novgorod armed forces and home guards defeated the Swedish army on the bank of the Neva, in the estuary of the River Izhora in 1240, meant to emphasize the inviolability of the north-western frontiers of Russia. In 1718 a special decree was issued that prescribed the make a “road” through the impassible swamp for the passage of His Imperial Majesty and His High Family as wells as pilgrims and poor passers-by to the monastery and for the monastery’s everyday needs”. The build road was later name the “Neva Perspective” and still later “Nevsky Prospect”. The young Tsar Peter the Great paid a special attention to the construction on Vasiliyesky Island conceiving it as the future centre of the city. The trade port, formerly located on the southern bank of Urban Island, was transferred to Vasilyevsky Island, which markedly intensified construction work in this area. So the Peter and Paul Fortress, The Admiralty shipyard, the Summer Gardens with the Palace of the Peter the Great and the buildings on the Spit of Vasilyevsky Island became the original landmarks promoting the future brilliance of St Petersburg. A century passed and one of the most beautiful cities of the world,” “of northern lands the pride and beauty”, as the great Russian poet Alexander Pushkin described it, “sprang out of the dark of mire and wood”.